It has been a huge success with thousands of baits sold in Australia and overseas, proving that simple ideas are often the best. Green Termite Bait Systems is a sister company to Green Pest Control. We commenced trading in 1988 as One Go Pest Control on the Gold Coast. It was founded by Jerry Furnell (P.C.O. Lic. 2143) with just one aim… To provide excellence in service for every client. It has been a huge success with thousands of baits sold in Australia and overseas, proving that simple ideas are often the best. Today we have orders for our termite bait systems from around Australia as well as from with-in the pest control industry. Our recent invention called the Ec2c Termite Window is a huge step forward in the detection and monitoring of termite activity inside homes. It is fast becoming an integral part of the overall Green Termite Bait System. Although our head office is based on the beautiful Gold Coast, our sister company Green Pest Control also provides prompt service for our Brisbane, Ipswich and Sunshine Coast clients; service which is provided by our helpful and friendly technicians who live in Brisbane and the Sunshine Coast regions. In recent years the pest control industry has seen many changes. Green Termite Bait Systems strives to stay at the forefront of technology. New products and equipment are tested and assessed as they come onto the market. The products we use are chosen because they are effective, safe, and offer value for money. You benefit because we test everything first, then select the best. After 5 years we changed our name to Green Pest Control to reflect our efforts to use environmentally friendly products. 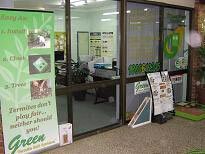 In 1996 we developed the first Green Termite Bait System and started trialing it on the Gold Coast. In 2003 we launced our wholesale division and started marketing our products to the pest control industry in general. based on customer feedback and trials carried out in a range of conditions. Jerry Furnell is the founder of Green Termite Bait Systems and has 25 years “hands on” experience in all facets of the Pest Control and Management Industry. He is a fully licensed pest control operator including Timber Pests. Jerry is the inventor of the Green Termite Bait™ and the Green Termite Bait System™ as well as the EC2C Termite Window®. He also developed the Integrated Termite Management program for the Termiproof warranty. His experience and knowledge of termites is extensive. If you have any questions regarding termites please e-mail Jerry for assistance and you will be answered shortly.